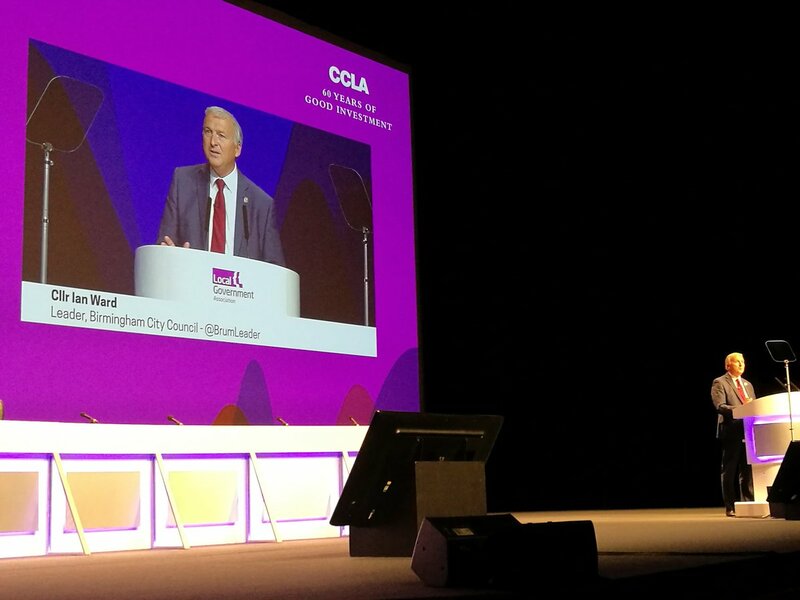 My speech welcoming the 2018 LGA Conference to Birmingham. May I offer you, the Secretary of State and all our delegates a formal welcome to Birmingham – one of Europe’s youngest cities and, of course, home to the UK’s largest local authority. I hope the next few days in our city prove to be enjoyable, enlightening and fruitful as many of the leading figures in local government come together to inspire and be inspired. You come to Birmingham at an exciting time – we’ve even given you Blue Skies… but more of that later. This young, diverse, creative city is going through a dramatic period of transformation at the moment. In fact you could argue that we’ve entered a golden decade that will define Birmingham and the wider region for generations to come. We’re building homes, attracting investment, creating jobs, building the infrastructure for HS2 and preparing to host the 2022 Commonwealth Games. Birmingham is a city that is buzzing with the noise of regeneration and we have many reasons for optimism. But of course like every town, city and county represented here this week, we have our challenges. And sadly, at a time of continued cuts, those challenges are what get most of the attention, as the coverage of local government focusses on what we are no longer able to do. The cuts and the bad news get the headlines, while the good work goes largely ignored. This is not a glamourous sector, but councils up and down the country are providing essential support and services. We’re the safety net; the very frontline of the welfare state and we’re currently needed more than ever before by the millions of people we serve. Local government might not tug at the heartstrings like the NHS, the police or the fire service, but we are no less important. And one thing that everyone in this room knows is that local government matters. Of course, the to-do list for councils across the country is a daunting one, but I know that there are dedicated teams of committed professionals from councils up and down the country that are rising to the challenge on a daily basis. Local government is blessed with creative, resourceful and tireless officers and councillors who, just like their NHS counterparts, are there to support people from the cradle to the grave. Over the last eight years, we have continued to deliver vital services and support in the face of unprecedented cuts – in Birmingham for example our budget has been slashed by over £650 million a year as a result of Government grant cuts and rising costs. That same period has seen demand for many of our services grow. The housing crisis, bridging the skills gap, ever-rising demands for adult social care and preparing for a post-Brexit economy are just a few of the challenges faced by our sector. The Secretary of State will hear a lot about those challenges at this conference, but he will also hear, and hopefully acknowledge, how this sector is getting on with the job and working harder than ever to improve outcomes for the people who rely on us. That’s certainly what we’re doing here in Birmingham. As I said earlier, this is one of Europe’s youngest cities; with almost half of the population aged under 30 and 30 per cent of people are under 20. And, while that presents us with many challenges, just think about all the possibilities – the enormous potential of our young people. This city is a conveyor belt of talent and our task as a city council is to work with partners – from the Government and the business sector through to community organisations – so we can create the right environment for our young people to shine. So, how do we harness that huge potential? How do we convince the next generation that Birmingham is a place where they can develop and thrive; where talent is nurtured and young people are given every opportunity to succeed? We do what councils have always done and what councils throughout the UK are doing every day – in spite of austerity. We build the houses needed by a growing population. We work with business to attract the investment that will create the jobs and opportunities that our young people deserve. We work with our schools, colleges and universities to ensure that young people are being equipped with the skills needed to take advantage of those opportunities. And we provide the platform to showcase the talent, creativity and energy of the next generation. To give you an example, I’d like to close by showing you how the young people of this city showcased their talents to a global audience of over 1 billion people earlier this year. As I hope you’re all aware, Birmingham is preparing to host the Commonwealth Games in 2022 and in April, after Australia’s Gold Coast hosted the 21st edition of the Games, they passed the Commonwealth Games flag onto this city. That put Birmingham firmly in the spotlight as the talented young people you’re about to see were given a chance to show what this city has to offer and fantastically rose to the challenge. They made the city proud and reminded me that, despite the challenges and the pressures, working in local government continues to be a rewarding and worthwhile experience. We’re here to work for and with our citizens, so let me show you how Birmingham did just that. In 2022 we would like to invite people from across the world to our city to see the Games and you will all be very, very welcome. In the meantime, have a great conference. Thank you and enjoy the city.